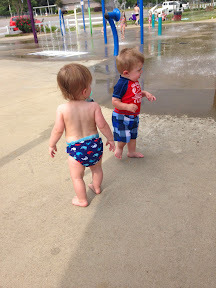 Last Tuesday we met Jackson and Jessica at the splash pad for some water fun. Barrett wasn't sure about the whole thing. 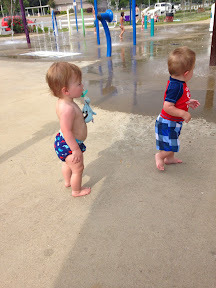 He started getting brave toward the end but never went to the water on his own. It probably didn't help that there were a lot of bigger kids there running wild. I think he was a little intimidated. But he looked really cute. 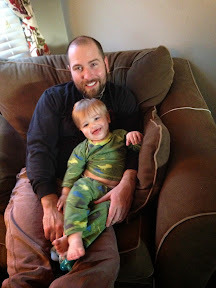 Hanging with Daddy before bed one night. 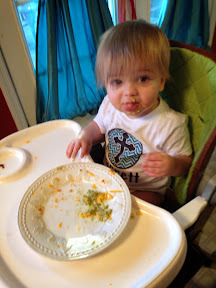 We had Taco night Friday night and Barrett enjoyed it. 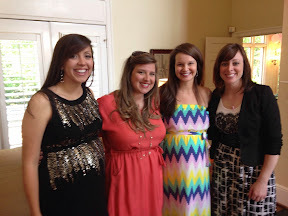 Saturday I met up with one of my oldest friends Kellie (on the end opposite me) and we went to our friend Rachel's baby shower. We were all in the youth group together at church. We had some of the most fun together. Rachel lives out of town so it was good to get to see her and celebrate this exciting time. While I was at the baby shower Barrett stayed with Patrick's parents. 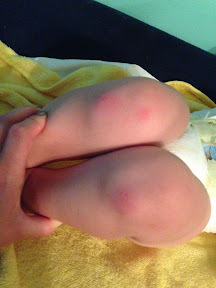 They were letting him run around in the driveway while Patrick did some work and he fell and earned his first skinned knees. They said he didn't even cry. Saturday night we say out on the deck and enjoyed the beautiful weather. Sunday we went to Mass then picked up lunch on the way home. 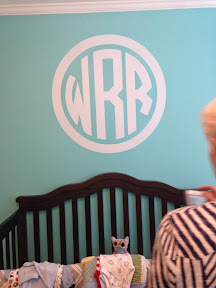 We all took naps then I headed to put up a nursery decal for my friend Marion. Her sweet boy will be her Friday and I can't wait to hold him! That was pretty much it. I did some cleaning which wasn't much fun! We've got a fun week ahead, looking forward to a weekend at the lake!